France offers a diverse range of landscapes and climates, which makes it perfect for all types of holiday. Take a trip down south to experience the almost Mediterranean climate and culture, or if Celtic and Norman history and culture is what you are looking for, the North offers great tourist regions such as Brittany and Normandy. The North of France offers a great selection of culture and attractions, and here you will find something for everyone. The region of Normandy offers unique tourist attractions such as the Battlefields of the World Wars, while on the West coast, Brittany is perfect for long walks along the Cote de Granite Rose and great seasonal food and drink. 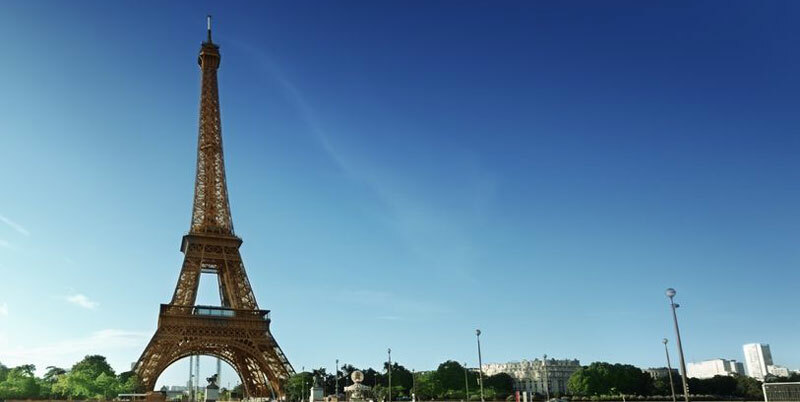 Whether you visit Paris on a day trip or Paris for a week, you will find plenty of things to do and see; Museums, theatres, shops, historic monuments and a beautiful riverscape along the River Seine. The main attractions and most popular include the Eiffel tower, Notre Dame, the Louvre and The Arc de Triomphe. The city has a great public transport system that includes buses, the underground and overground metro and the RER (express transit metro), making it one of the easiest cities to explore. A great way to discover the city is by boat: sail through the heart of historic Paris and discover the river Seine, listed as a UNESCO World Heritage Site. The French Rivera also known as the Cote D’Azur is the Mediterranean coastline of the South Eastern corner of France. This stretch of coast is a popular holiday destination due to its Mediterranean climate. Along the Riviera there are many fashionable and stylish cities such as Nice, Cannes, St Tropez and Monte Carlo. There are also quaint harbours fishing villages which have become chic tourist destinations, full of large yachts and summertime beaches. Walk along the coast and take in spectacular scenery and sea views. There are many coastal trails and seafront walks to enjoy. The Rivera is also the perfect base for watersports and outdoor activities. The French Alps are a large mountain range within France, located in the Rhone-Alpes and Provence-Alpes-Côte d'Azur regions. The French Alps offer high, snow capped mountains, lakes and beautiful towns and villages. In the winter months, many of these towns and villages are winter resorts offering a range winter sports and activities. In summer other activities such as horse riding, mountain biking, hang-gliding, climbing and hiking are all popular. Within the French Alps is the magnificent Mont Blanc, Europe’s highest mountain. The Alps are famous for their stunning beauty, including many alpine lakes, the largest being Lake Geneva; offering numerous water sports. We have some lovely accommodation in the French Alps, both for winter and summer. The alps provide some of the best skiing conditions and territories in Europe and the world. French holiday accommodation includes Hotels, self catering villas, chalets, chateaux, gites, holiday apartments, cottages, B&Bs, guest houses and campsites.